Leyland Cypress transplants are famous for fast growth, adding two to four feet of height per year and topping out at 50 ft with a span of up to 20ft. If planted in a small residential area, be prepared to trim seasonally. Like many other cypress, Leyland Cypress can be aggressively sheared and pruned and is therefore perfect for creating dense hedges and privacy screens. Although Leyland Cypress is not native to the USA, this statement is a bit misleading. It was cultivated accidentally in Great Britain between two other species which actually ARE native to the USA [Nootka false cypress / Chamaecyparis nootkatensis and Monterey cypress / Cupressus macrocarpa]. This accidental hybrid was found to achieve fast growth in a wide range of soil types, thus making it very practical and therefore desirable. Some argue however that this species is boring and even unattractive, but my option is otherwise…you are welcome to have your own. This species is nearly perfect for use as a privacy screen in open areas where it can be allowed to grow at its own pace. It does not lose lower branches or lower needles as with some other species. 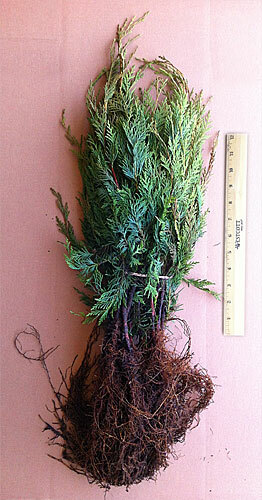 In high wind conditions in wide open spaces, however, the Leyland Cypress is susceptible to blowover due to its fast top growth combined with its average root growth. Planting another species nearby to buttress the Leylands can alleviate this problem, or plant more Leyland Cypress than would otherwise be necessary to plan for possible losses. Blowover is more likely in wetter soil conditions. Leyland Cypress can grow in a wide range of soils and pH levels and even poor soils, but drier well-drained soils are generally best. This also means the Leyland Cypress is moderately drought tolerant. They are quite aggressive below ground, using their own naturally occurring root-borne herbicide to push out competing roots from nearby plants.